St. Barnabas and St. Susanna (SBSS) Coptic Orthodox Church of Baltimore was inaugurated with the blessing of His Holiness Pope Tawadros II at the hands of His Grace Bishop Karas on September 5, 2015. In the years prior to the start of the church, God was busy at work in the hearts of the founding members of the church planting seeds for the future. Their vision was to establish a church that would be focused on serving the future of the church, their children. As this vision was maturing in their hearts, God was also at work in the heart of Fr. David who was serving as a general priest at the time. During this time, he was exposed to Coptic communities that had begun praying purely in English, making the richness of the Orthodox faith accessible to all. In time the path of founding families and Fr. David crossed and found common ground that led to a vision for a church in Baltimore. Over the course of a year God continued to mature the vision for the community that would include key lessons learned from a great deal of adversity that was faced along the way. Those lessons would weave their way into the mission, vision and core values of the community serving as a guide to this community. All this and so much more culminated in the opening of the church on September 5th, 2015. While there is much to say about our beginning and how we witnessed the hand of God in establishing this community, we encourage you to come and see us in person! 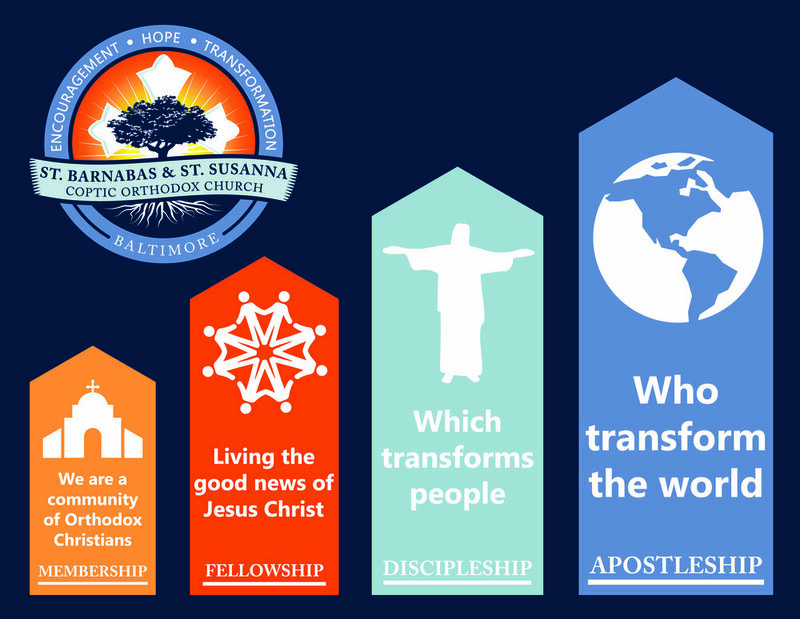 We are a community of Orthodox Christians living the Good News of Jesus Christ which transforms people who transform the world. Membership: As the Lord told his soon to be disciples ‘come and see’ (John 1:38-41) we invite all to ‘come and see’ our Christ-centered community. Fellowship: “By this all will know that you are My disciples, if you have love for one another.” (John 13:35) How we love one another at SBSS is essential to making church an accepting and encouraging home to all. Apostleship: In the spirit of the Great Commission we see the spread of the Good News of Jesus Christ as a way of life for our community rather than a specific ministry of the church. We are all called to be a light to those around us ushering them into a relationship with God. By preparing the church to be a place of encouragement and hope it also becomes the place where a transformational encounter with Christ occurs for all who come. Relevance: We proclaim the eternal truths of the gospel from the Orthodox Worldview through relevant teaching and meaningful ministries. Integrity: We endeavor to live and serve with Godly integrity in all that we do. Discipleship: We aim for the spiritual formation of each person through intentional discipleship to become the image of Jesus Christ. Generosity: We desire to be a blessing to those around us through the offering up of our time, gifts, talents and finances because have received abundantly from God. Evangelism: We strive to share the joy of Orthodox Christianity through the individual witness of our parishioners, our service to the City of Baltimore and through any door God may lead us through.